With all eyes focused on Mars, what about Earth? The Mars Rover Curiosity could not be more aptly named. As Scienceline’s own Miriam Kramer discussed a few weeks ago, that little robot is freaking amazing. Think about it. A few decades ago our parents watched the moon landing on television, but now you can watch a robot land on Mars from your miniature hand-held computer. Yes, your iPhone. Part of me is awash in the fist-pumping-the-air-for-science thrill that Curiosity is showing everyone the wonders of science. But with all eyes focused on Mars, what about Earth? I’ll bet you never thought that wind was awesome, with exception to the times it has a really bad attitude in tornados and hurricanes. 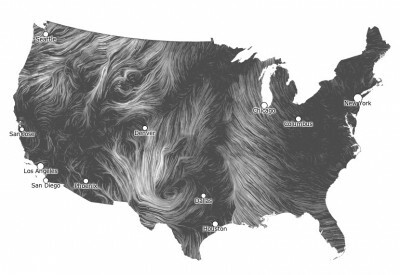 Well to prove you wrong, here is a real-time wind map of the U.S. This is the coolest weather map you will ever see. Despite the trippy music, this was not made to entrance tired cubicle workers and stoners. It’s science! NASA made this visualization using ECCO2, which stands for Estimating the Circulation and Climate of the Ocean. This fancy software turns a bunch of data from satellites and sensors into this spiffy visualization to help scientists predict how the ocean might get screwed up as climate change strengthens on the planet. 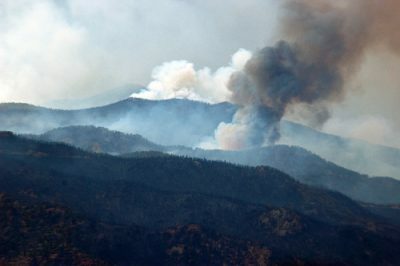 Colorado stole the show in this year’s fire season, notably the rampant Waldo Canyon fire that burned more than 18,000 acres. But other parts of the world are very good at catching on fire, too. Watch the flames shift across the continents in this map from NASA, which documents 12 years of the global fire cycle. John Nelson has awesome GIF and year-by-year of the U.S. fire season. The Waldo Canyon Fire in Colorado, seen from Pikes Peak. Before we head out, a quick nod to NASA’s World of Change galleries. Representing some highlights from LANDSAT satellite data, these galleries give us an overhead view of the dramatic changes on Earth. Watch Alaska’s Columbia Glacier ebb and flow in eye watering false-color. Watch Lake Powell and Central Asia’s Aral Sea waste away in the desert heat. Watch the forest around Mount St. Helens slowly recover after the devastating eruption. I love you Mars, but ours is bigger. We have spiraling wind, ocean currents, wildfire pyrotechnics, not to mention that whole evolution of a few million species thing. 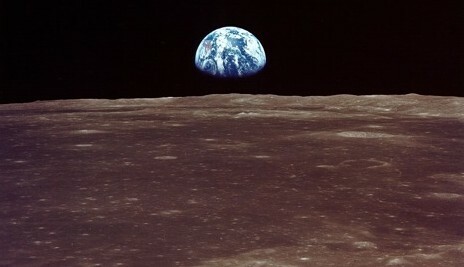 So as we marvel at Mars, lets not forget just how incredible our own planet can be. Looking at the Perpetual Ocean by NASA video, I wondered: it seems to depict that the ocean currents swirl up the coast of Japan, and then wend their way across the Pacific to Central/South America coastlines. If that is so, why isn’t the tsunami debris going that way, rather than Oregon/Washington coastlines?